Preheat the oven to 425 degrees Fahrenheit (175 degrees Celsius). In a medium bowl, combine the balsamic vinegar, honey, a tablespoon of olive oil, garlic, thyme, rosemary, chili flakes, salt, and pepper. Stir well to mix. While the chicken marinates, place the potatoes and Brussel sprouts, carrots onion, mushroom on Preheat the oven to 425 degrees Fahrenheit (175 degrees Celsius). 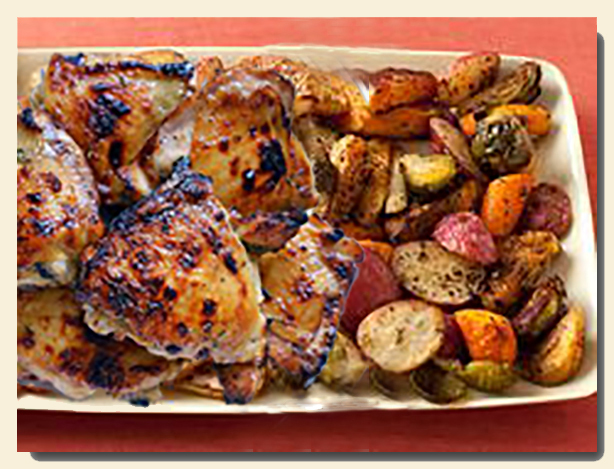 While the chicken marinates, place the potatoes and Brussel sprouts, carrots onion, mushroom on a sheet pan. Drizzle with the remaining olive oil, season with salt and pepper, and stir to coat. Bake for 20 minutes. Remove the sheet pan from the oven. Remove the marinated chicken from the plastic bag, reserving the remaining marinade in the bag. Place the marinated chicken, evenly spaced and beside the vegetables (chicken should not touch or be put on top of the veggies). Pour the marinade from the bag over the top of the chicken and vegetables. Return the sheet pan to the oven. Bake for 25-35 minutes, periodically basting the chicken with the pan juices, until the internal temperature of the chicken reaches 165 degrees Fahrenheit (74 degrees Celsius). Allow the chicken to rest for 5 to ¬10 minutes. Spoon the pan juices over the top of each chicken piece before serving. The vegetables should not touch the chicken or it will steam instead of roast. Line the pan with foil for easy cleanup. Chicken breasts could also be used.